The workshop was opened at Burundi University in the Burundian capital of Bujumbura by Freedom King, dean of the university's Faculty of Agricultural Sciences. The participants, who were welcomed by Joseph Bigirimana, plant pathologist and IRRI coordinator for East and Southern Africa, visited disease hotspots, collect diseased samples, and isolated and purified rice pathogens for molecular and pathogenic characterization. 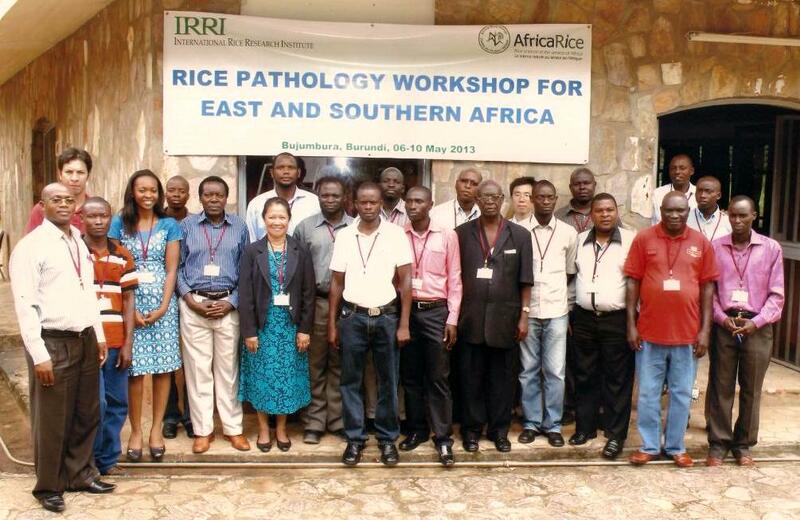 The workshop was also an opportunity for pathologists from both IRRI and AfricaRice to report and discuss with one another their respective plant pathology activities in ESA. Their efforts support the development of rice material with useful resistance traits for use in the region. Plant pathology specialists Drissa Silue (AfricaRice) and Casiana Vera Cruz, Ricardo Oliva, and Bo Zhou (IRRI) were the resource persons for the workshop.